The 21” Round Glass Table Top Protector is made of the finest quality furniture glass. This clear glass tabletop features a 1” flat polish edge and is 3/8” thick with a weight of 21 lbs. The edges of the glass are professionally polished to ensure a smooth to the touch feel. This small round glass top is perfect to use as a replacement glass or use to create a beautiful accent table, glass end table or nightstand. Glass top tables are popular since they can easily fit in with a wide variety of home décor and style of a room. This is a perfect addition to your living room, dining room or bedroom. These contemporary glass tops are available in many sizes, thicknesses and edgework - plus, they're tempered at no additional cost! Each round glass top includes free bumpons to place in between the glass and base of the table. They are expertly packed and individually cartoned with Styrofoam to protect from breakage during transit. The 21” clear round glass tabletop ships quickly via Fedex and is also insured to ensure a safe arrival. 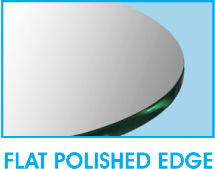 Shopping for Round Glass Tops online is easy at Glass Tops Direct. We feature many variations in size, shape, thickness and edge work as well as custom glass sizes. Whether you are purchasing a glass top as a replacement or as a table protector, we offer the finest quality glass at the lowest prices. 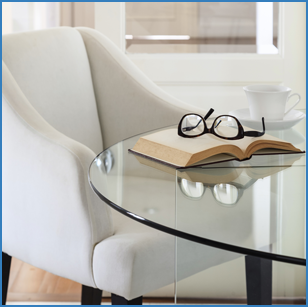 Your Round glass table top protector is tempered at NO ADDITIONAL COST. Tempered glass is 4-5 times stronger than standard annealed glass. Tempered glass is manufactured through a process of extreme heating and rapid cooling. Tempered glass table tops are more heat and scratch resistant than standard annealed glass.